(Bloomberg) -- Kazakhstan’s new president called snap presidential elections less than a month after he replaced leader-for-life Nursultan Nazarbayev in a carefully-choreographed transfer of power. 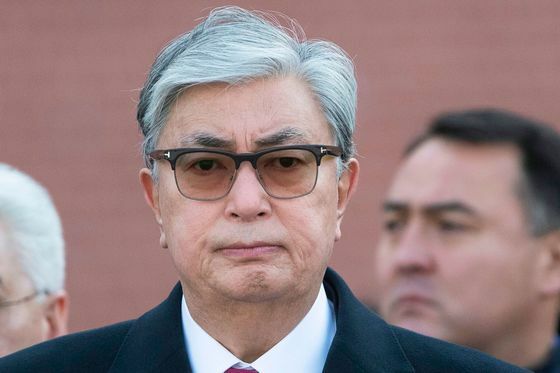 “I’ve taken the decision to call early presidential elections” on June 9 after consultations with Nazarbayev, Kassym-Jomart Tokayev said in a televised address to the nation on Tuesday. While the handover of power took place in a calm atmosphere, “it’s necessary to remove any uncertainty” by holding elections, he said. Tokayev, 65, didn’t say in his speech whether he will run in the elections. He was sworn in as president on March 20, a day after Nazarbayev announced he was standing down as leader of central Asia’s largest energy producer. Nazarbayev, 78, had ruled Kazakhstan since 1989 and lawmakers declared him leader for life in 2010. He remains head of the country’s security council with powers to issue executive orders to state bodies, and leads the Nur Otan party that holds more than 80 percent of seats in parliament. Kazakh sovereign bonds due in July 2025 climbed for a second day, reducing the yield two basis points to 3.49 percent, the lowest since February last year. The tenge was little changed at 379.81 against the dollar at 3:12 p.m. in Astana. One of Tokayev’s first acts as president was to nominate Dariga Nazarbayeva, the former president’s eldest daughter, to replace him as head of the Kazakh Senate. Her unanimous election put her in line formally to succeed Tokayev under the constitution, fueling speculation that he would be only an interim president before making way for her. Nazarbayev had previously ruled out handing power to family members. Nazarbayeva won’t run in June’s elections, the Tengrinews service reported, citing the head of her secretariat, Saule Mustafayeva. Kazakhstan was due to hold presidential elections in 2020. Tokayev announced the early vote after meeting with Russian President Vladimir Putin in Moscow last week, his first foreign visit as Kazakh leader. With Russia and China watching the succession closely, Tokayev faces a delicate task in balancing relations with Kazakhstan’s neighbors as they jostle for dominance in the energy- and mineral-rich region.